Submitted by via Cornwall Co... on Thu, 17/05/2018 - 10:21. The proposed garage/studio, by virtue of its inappropriate mass and scale, taller than the principle listed building having an inappropriate design would causes harm to the setting and special architectural and historic interests of the Grade II Listed dwelling 15 Steamers Hill. It has not been demonstrated that there is any public benefit, or other justification, that outweighs the harm to the setting of the historic character of the building. 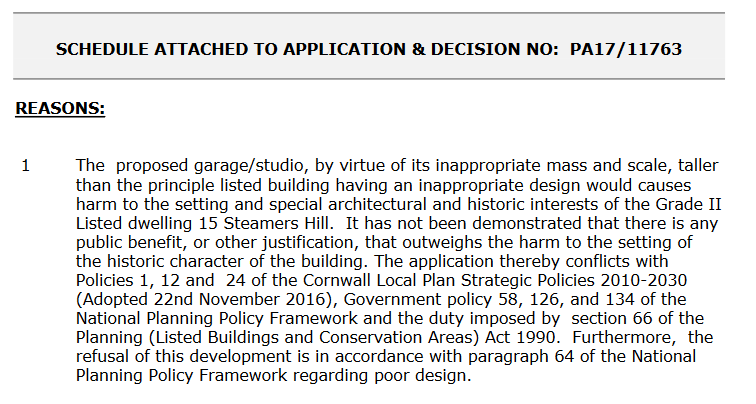 The application thereby conflicts with Policies 1, 12 and 24 of the Cornwall Local Plan Strategic Policies 2010-2030 (Adopted 22nd November 2016), Government policy 58, 126, and 134 of the National Planning Policy Framework and the duty imposed by section 66 of the Planning (Listed Buildings and Conservation Areas) Act 1990. Furthermore, the refusal of this development is in accordance with paragraph 64 of the National Planning Policy Framework regarding poor design. Neighbourhood Development Plan has passed external examination. character of the nearby Listed Building. the significance of designated and non-designated assets and their settings"
the studio/garage in this sensitive location. distinctiveness of the associated listed building. Listed Building and there is no public benefit from the proposal. considered to be overbearing or cause overshadowing to the neighbouring dwellings.